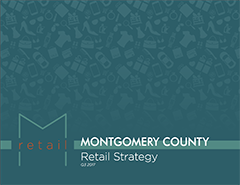 Montgomery County Retail Market Study – Recognizing the importance of retail to the County’s economic competitiveness, as well as its role in creating vibrant commercial areas, a countywide Retail Market Study was prepared by Streetsense, a Bethesda-based retail design and strategy firm. The purpose of the study was to assess the strengths, challenges, and competitive position of retail in the County to develop strategies that will foster successful retail centers and keep them poised for the future. The Economic Indicators is a fact sheet that tracks changes in key economic indicators including at-place employment, resident labor force, home sales, commercial vacancies and rents, and permit issuance activity. The Employment monitor report is a periodic summary of employment and unemployment trends in Montgomery County.